[PDF] Happy City: Transforming Our Lives Through Urban Design | Free eBooks Download - EBOOKEE! Posted on 2017-10-18, by luongquocchinh. Description: Happy City is the story of how the solutions to this century's problems lie in unlocking the secrets to great city living. This is going to be the century of the city. But what actually makes a good city? Why are some cities a joy to live in? As Charles Montgomery reveals, it's not how much money your neighbours earn, or how pleasant the climate is that makes the most difference. Journeying to dozens of cities - from Atlanta to Bogota to Vancouver - he talks to the new champions of the happy city to explore the urban innovations already transforming people's lives. He meets the visionary Colombian mayor who turned some of the world's most dangerous roads into an urban cycling haven the Danish architect who brought the lessons of medieval Tuscan towns to modern-day Copenhagen and the New York City transport commissioner who turned the gridlock of Times Square into a place to lounge in the sun. Drawing on the lessons from their stories, from brain science, and from the fascinating realm of urban experimentation, Happy City offers solutions we can all use to improve our lives and shows that simple changes can make all the difference. "Do we live in neighbourhoods that make us happy? Montgomery encourages us to ask without embarrassment, and to think intelligently about the answer". (The New York Times Book Review). 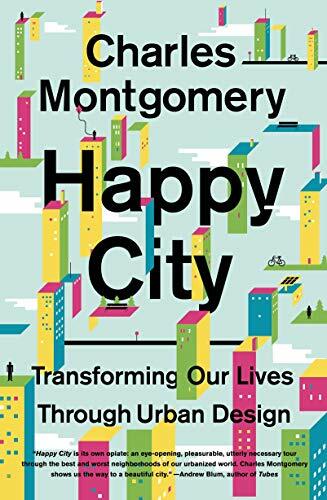 "Excellent...Montgomery believes in the importance of smart town planning and Happy City is a compendium of its major ideas". (Will Dean, Independent). Charles Montgomery is a journalist and urban experimentalist from Vancouver, Canada. His writings on urban planning, psychology, culture, and history have appeared in magazines and journals on three continents. He is the author of one previous book, and was an original member of the BMW Guggenheim Lab. No comments for "[PDF] Happy City: Transforming Our Lives Through Urban Design".